For those who enjoy challenging games, it is often difficult to find a high-quality option to play on the iPad, iPod Touch, or other mobile device. Fortunately, one app that is incredibly challenging and enjoyable to play is Bike Baron by Mountain Sheep. The application Bike Baron revolves around a crazed Biker who must traverse insane obstacle courses in order to reach the course end and move on to the next level. Players must control the biker to make incredibly precise jumps and movements throughout the course so that he is able to reach the end without fail. Each level has a unique course that requires perfect precision in order to complete. 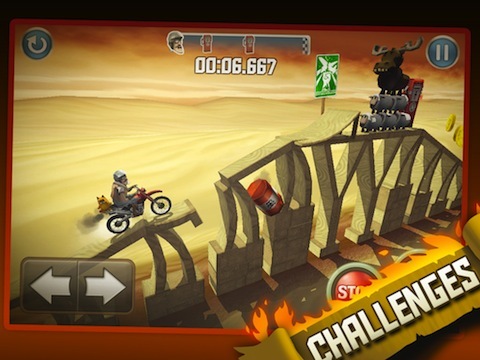 The main appeal of Bike Baron is the incredibly challenging levels. The app comes with over 40 levels, and while some can be completed without too much trouble, the majority of them are incredibly difficult and will not be completed without an immense amount of time spent practicing and learning the course. The iPhone app is not linear, which means users are able to complete most of the levels in any order they choose and can temporarily skip over those that are causing them the most trouble. Each time that the player completes a level, he will be rewarded with a star. As the app progresses, however, players will not only need to make it through the levels alive, but will also be required to complete levels under a time limit, collect a certain number of coins, and avoid any crashes or flips. Those who are able to earn three stars on every level will gain access to the bonus Joker levels, which are nearly impossible to beat without an innumerable amount of hours practicing. Along with the challenging aspect of the app, another highly favorable feature is the incredible graphics and sound. Rather than being a two-dimensional platforming game, the graphics of Bike Baron are three dimensional and incredibly captivating. Additionally, the excellent audio and soundtrack further enhances the game’s quality, making the overall environment incredibly appealing. One drawback to the app that the players may find frustrating is that the biker is incredibly fragile. Even small mistakes, such as having him graze his head over a surface, will cause him to crash and be defeated, forcing the player to begin the level from the start. While this may add to the challenge, the movements that must be made in order to avoid crashing are so precise that many may become frustrated. Overall, the immense difficulty of Bike Baron makes it a poor choice for any gamers who become frustrated easily. For those who enjoy a challenge, few games are more enjoyable than Bike Baron. 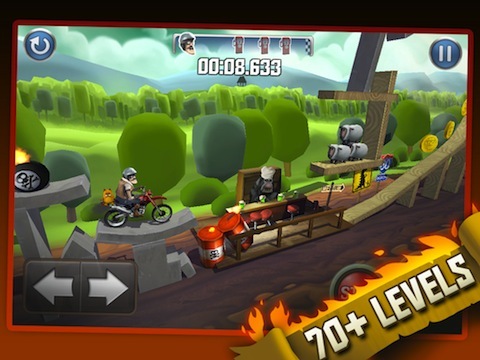 AppSafari review of Bike Baron was written by Joe Seifi on December 18th, 2011 and categorized under Action, App Store, Featured, Fun, Games, iPad apps, Racing, Universal. Page viewed 5042 times, 1 so far today. Need help on using these apps? Please read the Help Page. Extreamly addictive and frustrating but over all a great game for all ages.